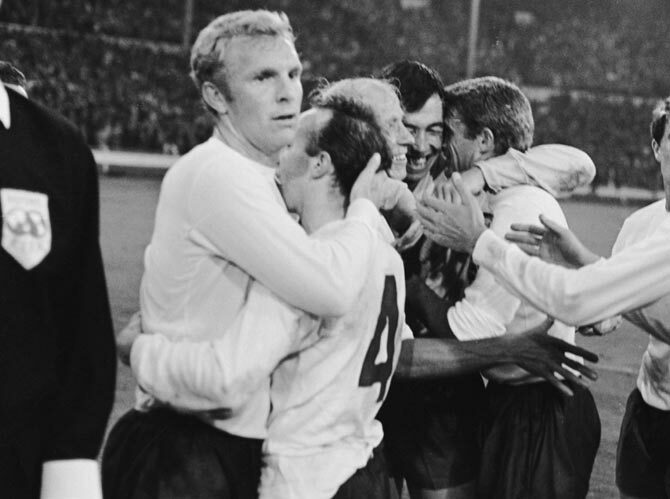 - England's first semi-final appearance at a World Cup came at their home tournament in 1966. In front of more than 90,000 fans at Wembley Stadium, Bobby Charlton put them ahead with a rebound shot from a clearance in the first half and added another after the break to go 2-0 up against Portugal, led by 1965 Ballon d'Or winner Eusebio. The Portuguese cut the deficit in the 82nd minute with Eusebio's penalty but the hosts held on to set up a final against West Germany, whom they beat 4-2 after extra time to lift their only international trophy to date. - The Three Lions reached their second World Cup semi-final in 1990 but it was a far less joyous experience. England and West Germany were goalless at halftime at Turin's Stadio delle Alpi. German Andreas Brehme put the 1982 and 1986 World Cup finalists ahead with a deflected shot off Paul Parker. With time running out and pressure mounting, England charged forward and their all-time top World Cup scorer Gary Lineker snatched an 80th minute equaliser to send the game into extra time. Despite both teams hitting the woodwork and missing chances to score in extra time, including David Platt having an effort ruled offside, they were still tied 1-1 when they went to penalties. The Germans and English scored all of their first three penalties, with Brehme, Lothar Matthaeus, Karl-Heinz Riedle and Lineker, Peter Beardsley and Platt. But then Stuart Pearce had his penalty saved by Bodo Illgner before Olaf Thon converted Germany's fourth to give them the edge. Chris Waddle then sent his effort high over the bar to send West Germany through to the final and leave England's Paul Gascoigne in tears. - Croatia, who became independent after the breakup of Yugoslavia in the early 1990s, made their first World Cup appearance in 1998 and reached the semi-finals at their very first attempt. Led by current Croatian Football Association President Davor Suker and a string of talented players who learned their trade in what was then Yugoslavia during their youth years, including Alen Boksic, Zvonimir Boban and Robert Prosinecki among others, Croatia enjoyed a fine run to the last four. They finished second in their group behind Argentina but then edged Romania in the round of 16 with a Suker penalty before stunning Germany 3-0, with Suker again on target. The Croats' 'golden generation' then took a 1-0 lead over hosts France at Paris' Stade de France early in the second half with Suker's fifth goal of the tournament but Lilian Thuram scored twice -- his only international goals -- to carry the home nation to a comeback victory and a spot in the final. France beat Brazil to lift their first World Cup while Croatia had to settle for third place after goals from Suker and Prosinecki gave them a 2-1 win over Netherlands in the third place playoff match. - Before its independence Croatia was part Yugoslavia, who had reached the World Cup semi-finals twice. Nicknamed 'the Brazilians of Europe', the Yugoslavs lost to Uruguay 6-1 in their 1930 semi-final at the inaugural World Cup. They also reached the last four in 1962 before losing to Czechoslovakia. Croatia-born Drazen Jerkovic was joint top scorer of the 1962 tournament and was briefly caretaker coach of a still-unrecognised by both FIFA and UEFA Croatian national team in 1990.